Battery Tender 081-0069-6 Ring Terminal Harness with Black Fused 2-Pin Quick D.. The Fimco broadcast spreader is built of steel to last for years. It attaches onto an ATV instead of being pulled behind one, making it easier to maneuver. It holds up to 99 pounds of dry material like salt, seed, fertilizer, or sand for multi-season use. Powered by a 12v adjustable speed motor, it throws a pattern from 5-45 feet from the steel fan. This 51 pound unit is ideal for property owners, caretakers, farmers, and landscapers who need a versatile and dependable spreader. Product was great price and as described. Shipped promptly. Great eBay seller! Super fast shipping! Item as described and shipped quickly. Thanks! This is a well built product & works great. 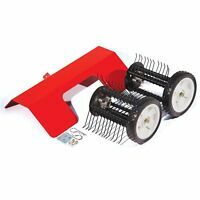 We do a lawn care company and were looking for a spreader other than a pull type. We mounted it on the back of a John Deere belly mower using the 4-wheeler mounting hardware and added a metal bracket on the lower back of the mower. It can still be removed with two bolts & two nuts. We have used it on ten yards already. The variable speed motor makes it so handy when spreading through a narrow area you can just turn the control nob down & the motor speed slows down so we don't through the product where we don't want it to go. The slinger, slide gate & gauge setting are all made out of stainless as I can tell, checked them with a magnet. We are already talking about getting another one to try and mount on the front of a zero turn or stand up mower. We have run grass seed, lime & fertilizer through it and it all went great. With the pull type spreaders we used we had trouble putting out 30 # of lime per 1000 sq. ft. in one application. This one will do 30# & more no problem. The gate valve handle only has to be move about a 1/2" from close to open. We really like this product. . Can't wait to try it with salt this winter. I have a big lawn and wanted a good spreader to fertilize it. It worked great. The chart setting was way too heavy. Use your own judgement and start light. Had a little trouble adjusting the spread thickness side to side. I'm hoping to use it to seed grass. The variable speed is great. Very good quality unit. AOK---can mount front or back. Do not use water to hose clean--Will get in motor!! Should have a seal on motor shaft, other wise OK! I looked at many types of ATV rear mounted spreaders and the Fimco seemed to be the best for my needs. 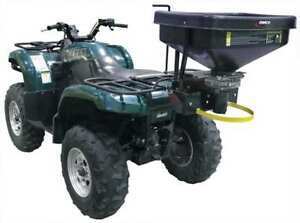 Small foodplots and spreading seed, lime and fertilizer. The mounting brackets on this spreader are very thick angle steel. No flexing at all. The variable speed control was faulty out of the box but Fimco sent a new one right away and it works great. Stainless steel motor shaft, metering plates and spinner are quality and easily cleaned. Well made in the USA.